NASA is about to launch a rocket that will puff out highly visible clouds of red and blue-green vapour into space. The rocket was supposed to launch on May 31, but bad weather and poor visibility pushed the mission back to Monday, 12 June, with a liftoff time between 9:04pm and 9:19pm EDT (11:04am and 11:19am AEST). The sounding rocket carrying the experiment will launch from NASA's Wallops Flight Facility in Virginia, so if skies are clear at that time, many people on the US East Coast may see the brightly coloured puffs of 'tracer vapours' more than 90 miles (145 kilometres) above Earth about 5 minutes after the rocket launch. People as far north as New York City may be able to see the psychedelic space clouds appear low on the South-Southwest horizon. "I've seen some of these tests where the clouds really filled the sky," Keith Koehler, a NASA Wallops spokesperson, told Business Insider. "My guess is if you held your fist up, that might be the size of the clouds [close to the launch site]." 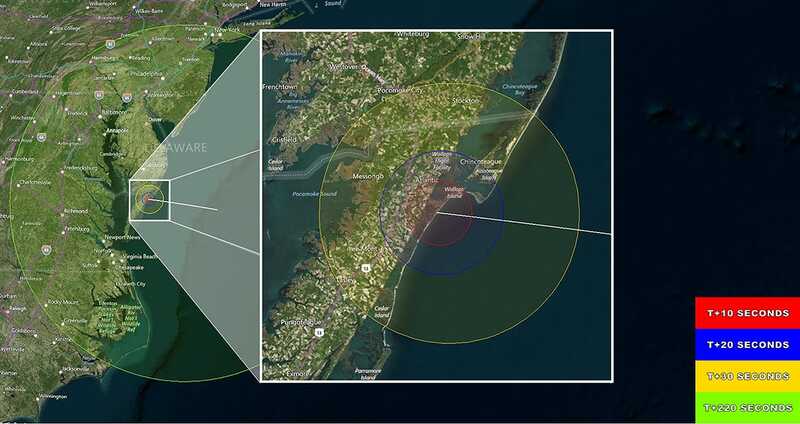 If you won't be in this area at that time, don't fret: NASA Wallops will host live video on Ustream, with coverage kicking off around 8:30pm EDT. The experiment is one of many missions in an international 'Grand Challenge' initiative that aims to help scientists better probe two gaping holes in Earth's protective magnetic shield, called cusps. The huge magnetic bubble that surrounds our planet is vital to life, since it deflects the sun's constant wind of high-energy particles - and protects against the occasional solar storm. Without this invisible force field, Earth may have gone the way of Mars, a planet which lost its magnetic dynamo billions of years ago. That allowed the sun to blow most of the Martian atmosphere into deep space, turning a once wet and potentially habitable world into a dry and nearly airless global desert. While we won't run out of air anytime soon (thankfully, our planet has quadrillions of tons left), scientists are still struggling to understand how the cusps work. In particular, they want to make them visible - which is where the coloured clouds come into play. Launching tracer vapors such as barium (green), cupric-oxide (blue-green), and strontium (red) into the Earth's ionosphere - where charged air particles and the solar wind interact - will show how the clouds move through the region. This data could then help verify and update computer models of the fringes of Earth's atmosphere. Those models, in turn, may help researchers better understand all sorts of high-altitude phenomena, including auroras, geomagnetic storms - and why a planet like Mars lost all its air while ours has held onto its atmosphere. Koehler says nearly all tracer-vapour missions, except for a few recent test launches, spew the vapors directly out of the rocket body. This limits the data that scientists can collect from the ground, however, because the coloured clouds are close together and often hard to distinguish. The upcoming launch will test a new method: Shooting lightweight canisters, called ampules, out of the sides of the rocket. The 10 canisters are expected to travel 6 to 12 miles (10 to 20 kilometres) before they start releasing vapour, which should make a constellation of coloured clouds that are easy to distinguish and follow from the ground. "They're made of aluminium and about the size of a Coke can," Koehler said of the ampules. The chemical tracer clouds aren't easily observable by themselves - they react to sunlight. So to maximise their visibility, the launch will happen when it's dark on the ground, yet the Sun is still visible from space (where the clouds will be created). "These launches have to occur just after sunset or right before sunrise. You need sunlight to hit the vapours and activate them as they're released," Koehler said. "Auroras dance across the sky, and this is not that." NASA Wallops is hosting a live video stream that kicks off around 8:30pm EDT (12:30am GMT). You can watch the feed here.